It’s that day of the year again—happy birthday to me! As of today, I am officially closer to 30 than I am 20, and I don’t know how I feel about that. But I digress, a birthday is a birthday and that means we celebrate. I’ll be pouring myself a nice glass of red wine and watching A Charlie Brown Christmas when I get home tonight. In the past, my birthday posts have been more reflective in nature (check them out here, here and here), so this time, I decided to mix it up. While birthdays are a great time for reflection, it’s also a time to celebrate and think about who and what makes you happy. 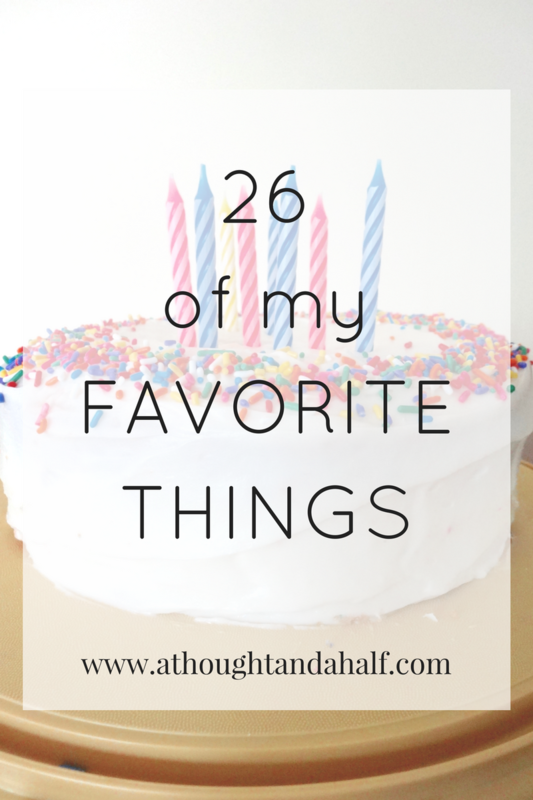 For my 26th birthday, I’m sharing 26 of my favorite things. Because birthdays are happy occasions and favorite things make me happy, too. These are in no particular order, of course. My Maggie Kitty. I love most all cats, but especially my sweet Maggie. I rescued her in September 2015, shortly after I moved to Chattanooga, and she’s the sweetest ball of fluff ever. She’s featured on my Instagram quite frequently. The Sound of Music. Did you start singing the “My Favorite Things” song at the beginning of this post? Because I hummed it to myself all while I was writing this. This is far and away my favorite movie; my mom introduced me to it when I was a toddler and my love for it has only grown since. I even saw the stage version when it came to Chattanooga a couple months ago! Cake. Especially the kind I make myself. 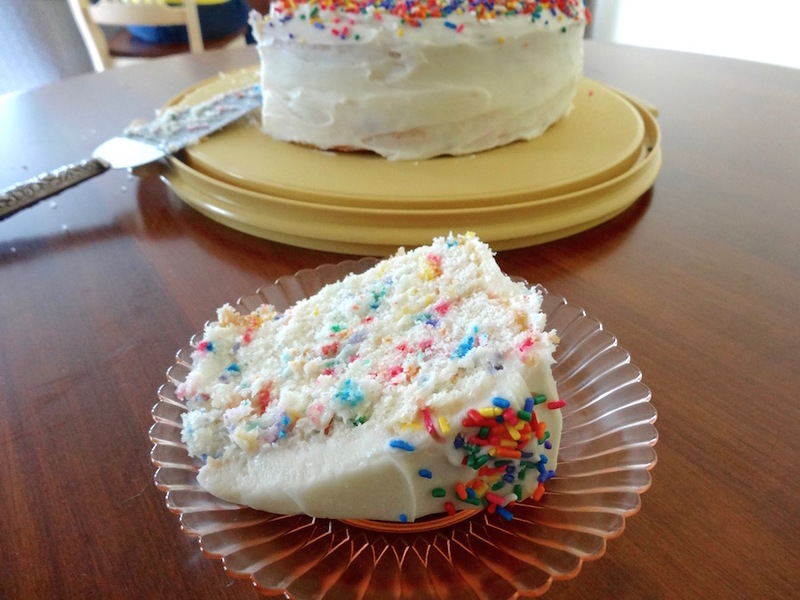 I made myself a vanilla layer cake over Thanksgiving and it was pretty darn delicious, if I do say so myself. Sausage balls. My mom has been making these for years, and it was one of the first things I remember learning to make for myself. I make them at all times during the year, but they’re extra special around the holidays. Brunch. It’s my favorite meal of the week. Whether I’m in the mood for chicken and waffles, French toast, or a classic eggs-meat-and-biscuit plate, there’s somewhere in Chattanooga that I can get what I want. This city is blessed with amazing brunch spots. Blanket scarves. Well, scarves in general. But especially blanket scarves. They’re so stylish and cozy! Apples & peanut butter. It’s such an easy, delicious snack, and it won’t kill your diet, either. I take an apple with my lunch almost every day, and I keep a jar of peanut butter at my desk for this purpose. FRIENDS. I love my real friends and family, of course, but I also really love the iconic television series. I didn’t watch it (in its entirety) until it came to Netflix a couple years ago, but I was hooked after the first episode. Chandler is my favorite; his one-liners are pure gold. That show is just so full of wisdom. Tea. Like any good Southern girl, I love a tall, cold glass of sweet tea. Hot tea is a blessing this time of year. I keep a stash at my desk at work and drink at least a cup a day… sometimes more. Green tea is my favorite, specifically jasmine or mint green tea. 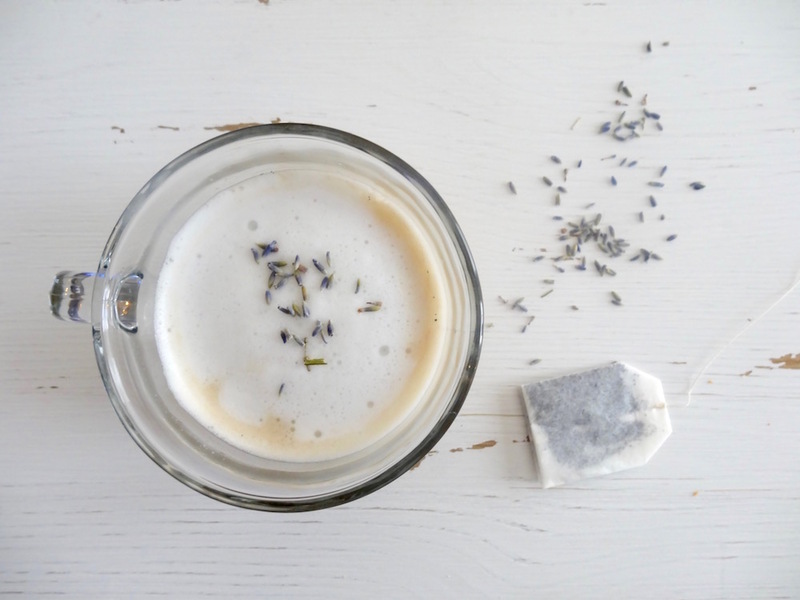 London Fog lattes are a recent obsession, too. Christmas music. My birthday falls at a perfect point in the year: fall is wrapping up, Thanksgiving is over and Christmas season is kicking off. That means it’s acceptable to play my Christmas playlist all day, every day. This year, I’m obsessed with The Piano Guys’ album Christmas Together. Blogging. Well of course! I’ve been at it for more than 6 years, so there’s something that keeps me coming back. I love my blog like it’s my child. Coffee. It’s pretty much my life blood at this point. If I don’t drink a cup of coffee within half an hour of waking up… well… it’s going to be a long day. It’s a good thing there are some great coffee shops near my office. 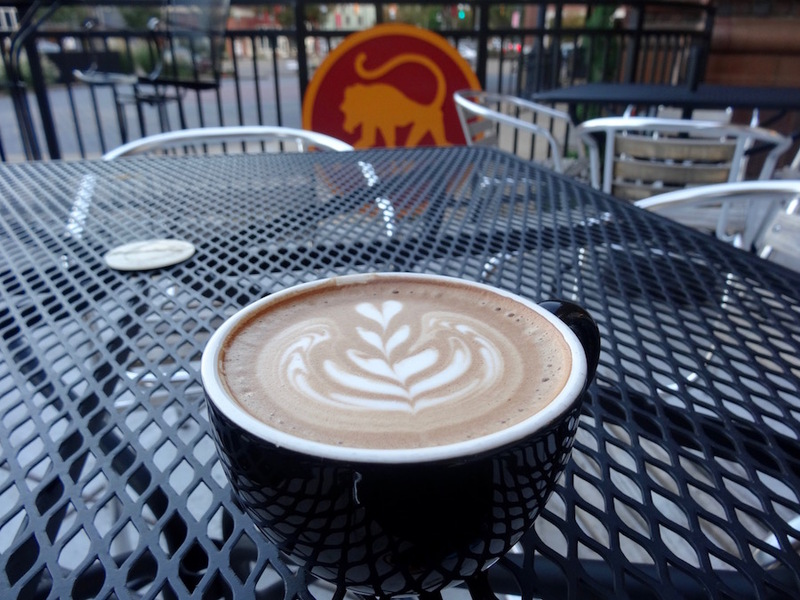 Frothy Monkey is one of said great coffee shops. Coffee mugs. The entire bottom shelf of my bar cart is covered–literally, covered–with coffee mugs. They’re one of my favorite forms of self-expression. Yellowcard. You know, the punk-pop band responsible for the classic “Ocean Avenue”? Yeah, I adore them. They split up earlier this year after 20 years, but I listen to their music almost daily. I was lucky to see them live twice (2013 and 2015) and they were easily two of the best shows I’ve ever seen… especially that 2015 show with New Found Glory. The Food Network. I sometimes joke that I’m one blog post away from my own Food Network show. I’ve actually learned a lot about food, cooking, prep work, ingredients, presentation from watching my favorite shows. Mint juleps. I don’t always order a fancy cocktail when I’m out, but when I do, I order a mint julep. It’s a classic Southern libation that makes me feel fancy as I sip on it. 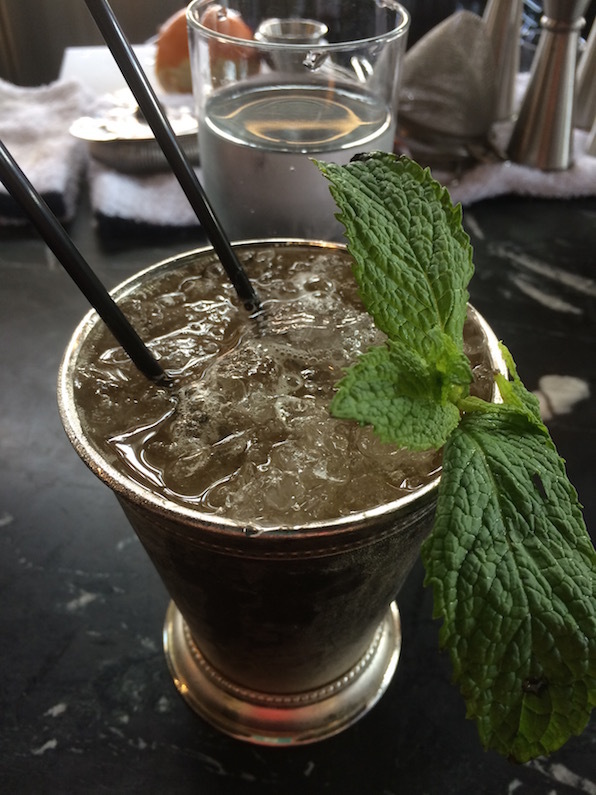 My favorite mint julep in town is at STIR; they do it right from the frosted cup to the fresh mint and artisan ice. Tom Cruise movies. Okay, a bit of a guilty pleasure, but I will never say “no” to the Mission: Impossible films. Maroon & orange. Admittedly a color palette that I didn’t quite understand until I visited my alma mater for the first time. But as soon as I became an accepted student at Virginia Tech, my color preferences rapidly switched from various shades of blue to Chicago maroon and burnt orange. My city. 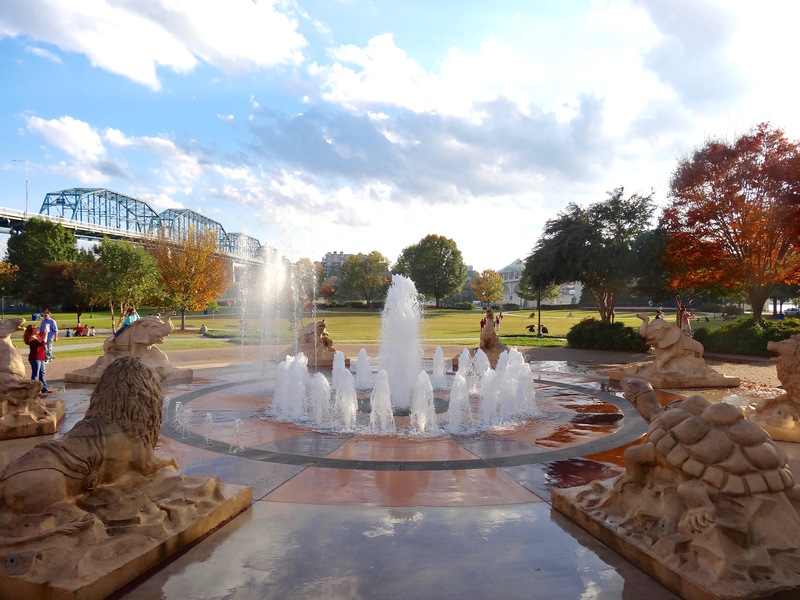 It didn’t take me very long to fall in love with Chattanooga when I moved here in 2015. The sense and feeling of community and love for the Scenic City and wanting to make it the best it can be is palpable and contagious. Yoga. It took me a while to get on board the yoga train, but now it’s one of my favorite ways to stay active. While I don’t take classes as often as I’d like (drop-in costs add up quickly), there are plenty of great yoga videos on YouTube that I can do at home. A nice 20-minute yoga routine before bed is my favorite way to wind down. Warm, fuzzy blankets. I have a whole collection of them and I add at least one more each year. My most recent addition is a blue and gray blanket with a wintry pattern from Sam’s Club that Maggie Cat has already claimed as her own. Rudolph the Red-Nosed Reindeer. It’s my absolute favorite Christmas movie. My mom always says that this movie was on TV in the hospital the night I was born, so it’s extra special in my family. I finally bought a copy on DVD this year so I can watch it whenever I want! Baking. Is it weird that I find baking relaxing? It is, though. Whether I need to destress after a long week, or if I’m stressed and need to focus on something else, I grab my bowls, mixer, flour, sugar and chocolate and whip something up. Cookies and brownies are my go-tos, but cupcakes are also fun and have the potential to get super creative. 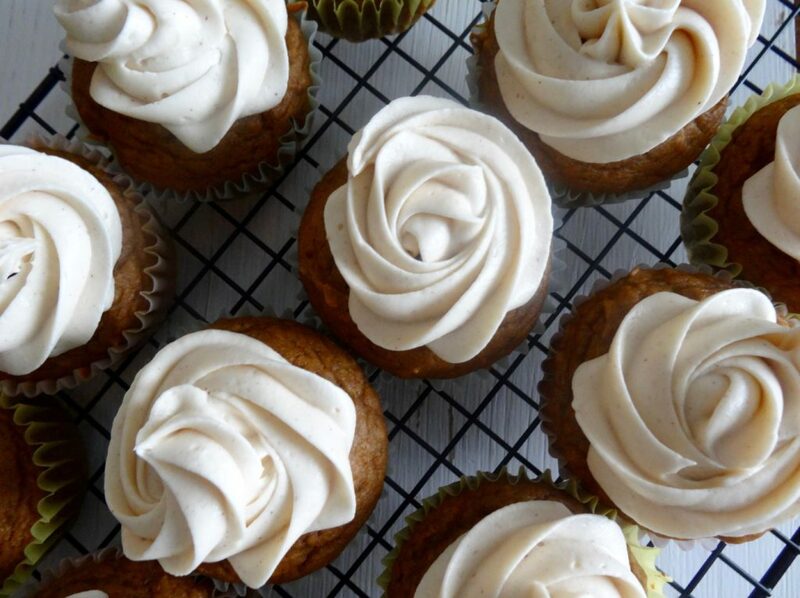 Pumpkin cupcakes with spiced cream cheese frosting… definitely some of the best treats I’ve ever made! Crafts & DIY projects. If I’m ever bored on a weekend, I will find some kind of craft or DIY to keep myself entertained. This summer, I painted a cooler for soccer tailgates. I’ve also DIY’d a photo display for my living room. Leggings. If you’d asked me 4 years ago, I would have said “leggings are NOT pants.” Well, now I wear leggings 4 or 5 days a week, so… who’s laughing now? They’re so comfortable! Podcasts. This is a relatively new thing for me. I’m late to a lot of trends and crazes, but once I get hooked, I’m hooked. Have I mentioned that I’m launching my own podcast in 2018? Yeah, that’s happening. I’m terrified and excited all at once. These are 26 of my favorite things that will always make me smile. Shoutout to Caroline at Adventures in Nonsense for the inspiration for this post! Check out her 25 favorite things post here. What are some of your favorite things? What are you excited about this holiday season?